2012 ended with social networking reaching new heights but tech experts say 2013 will still be about Facebook, Twitter, YouTube, Instagram and an introduction of the next big names, brands and applications which are all internet-based. With all these social sites, perhaps it is Twitter which is the "most showbiz". 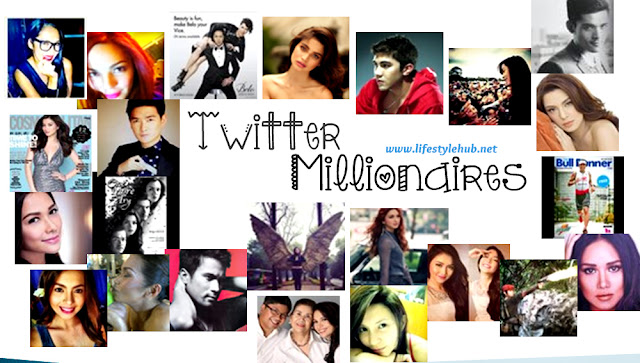 In July 2012, we came up with our first list of "Twitter Millionaires". By the end of last year, granting each follower is equivalent to one peso, who do you think are the new "Twitter Millionaires." From the previous 18 Twitter millionaires, our list grew to 23 as year 2012 closed. 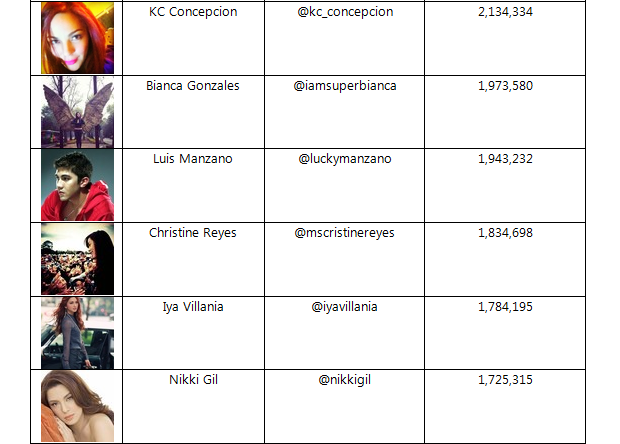 Anne Curtis is still the undisputed Philippine Twitter Queen with 3.9 million followers as of 2PM today, January 5, 2013. She is 1.2 million followers ahead of second-ranked Angel Locsin. It wouldn't make sense to compare the 2 actresses actually as Anne created her Twitter account before Angel did. 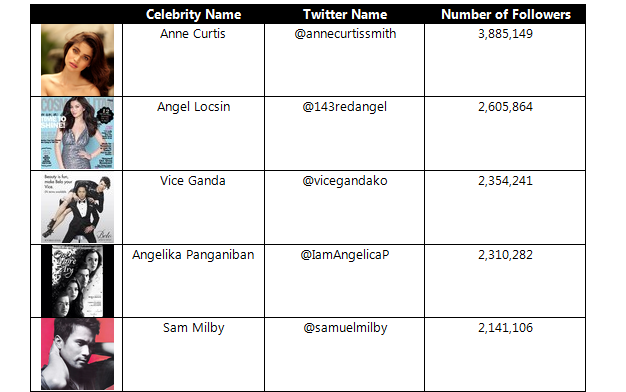 When it comes to engagement, Anne posted 22,163 tweets to date which is a huge contrast to the 7,544 tweets of Angel. Both accounts are now verified. I would like to emphasize that I didn't narrow my ranking exclusive to celebrities but it would be impossible for a private citizen to get a lot of followers and enter the list, isn't it? I tried to search for politicians, sportsmen, other digital influencers like Kimpoy Feliciano, bloggers, and newsmen but with the way our pop culture works, movie and television personalities dominate the list. Vice Ganda, is technically, the most-followed male personality here in the Philippines with 2.4 million followers. Tracking the increase of his followers for the last 6 months, it would be safe to estimate that Vice gathers an average of 2,600 new followers daily and 78,000 new followers in one month. Again, equating 1 follower as an earning and worth 1 peso, Vice earns way above minimum wage on Twitter alone. If Vice declines to be categorized as male, then Sam Milby would be the most followed male personality on Twitter. Only him, Luis Manzano, Kim Atienza, Xian Lim, Tim Yap and Daniel Padilla are the members of the male species in the female-dominated millionaires' list. 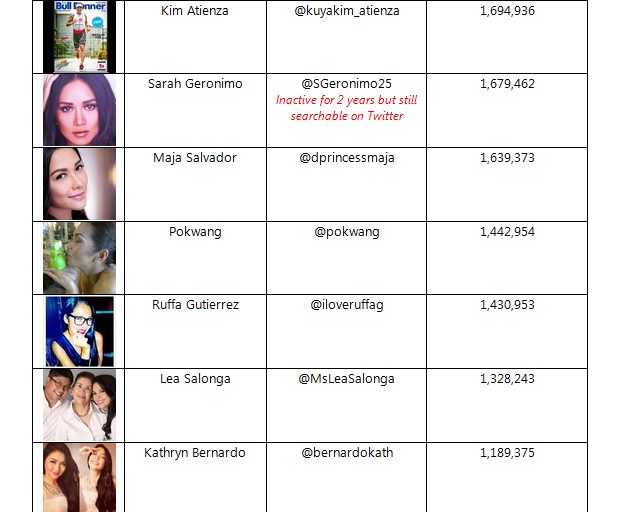 Biggest gains on Twitter followers will that be of the phenomenal team up of Kathryn Bernardo and Daniel Padilla. They are the only love team with more than a million followers each. Julia Montes aso barged into the millionaires' list last year. Below are the personal Twitter accounts ranked 24th to 50th. The new account of Kris Aquino didn't make it to the list this year but it can surge to a million followers before 2013 ends. Regine Velasquez and Sharon Cuneta's accounts may show up in the millionaires' list anytime soon too. If you can see below, YouTube sensation Jamich just barely eclipsed Carmina Villaroel for the 50th spot. The new Mrs. Legaspi has 500,057 followers as of 3PM today (January 5, 2013).